Hot on the heels of its massive PTSD series on the 3rd anniversary of the start of the Iraq War, The Oregonian delivers more stats and important information to its readership on combat-related posttraumatic stress disorder. Ron Cannon lost his right leg in a Vietnam minefield. Thirty-six years later, Luke Wilson lost his left leg in a rocket-propelled grenade attack in Iraq. They came together Monday in Salem with nearly 50 experts to say that while support for returning soldiers is broad, more must be done for Oregon's returning veterans. Post-traumatic stress disorder is a top concern, along with high unemployment, underemployment and alcohol abuse, despite an unprecedented effort to reach returning vets and their families. Although the President's 2007 VA budget calls for a 12.2% increase in funding, it still may fall far short of what's necessary to meet the need of our returning veterans. [A]t the Oregon Veterans Summit hosted by the Oregon Army National Guard in Salem, Congresswoman Darlene Hooley, D-Ore., said that the $339 million increase in mental health spending in that proposal still won't be enough to serve the needs of new combat veterans and those who served in previous wars. "The Oregon Army National Guard has lost enough soldiers," she said. "I don't want to lose any more when they come home." Hooley told a packed room at the Guard's readiness center that the story in The Sunday Oregonian about Sgt. Bill Stout and his family's struggle with his post-traumatic stress "perfectly embodies why we're here, why we have to focus significant resources on reintegration and give veterans the help they need." Staff members at the Portland Veterans Affairs Medical Center and at the Oregon Army National Guard reintegration team pointed to increasing evidence that returning veterans face immediate medical and mental problems. Nationally, one-third of veterans from Iraq and Afghanistan have sought mental health care, many of them for PTSD, drug abuse, depression and alcohol abuse. At the Portland VA Medical Center, one-fourth of the 775 veterans of Iraq and Afghanistan treated have sought mental health care. Of those, 62 percent screened positive for PTSD and 52 percent for depression. Sgt. Phillip Jacques, a member of the Guard reintegration team who has dealt with job, mental health and medical care problems for fellow veterans since he returned wounded from Iraq, reminded all of the war's cost. His team has intervened in at least four potentially life-threatening crises involving recently returned soldiers. "PTSD is a big ugly animal. It hits the guys you'd never expect, the real hard chargers," he said. "But for the most part, it's hit everyone." Thank The Oregonian and/or reporter Julie Sullivan for continuing their important work to educate their local communities on PTSD. They're showing other media outlets how it should be done. If you or a loved one are coping with posttraumatic stress disorder, you're sure to be curious about how it's treated. Here's a quick and general outline of the general treatment strategy for PTSD used by the author of The Post Traumatic Stress Disorder Sourcebook. Schiraldi said there a number of ways of treating PTSD, most of them centered on talking therapies. Educating the person - normalizing the symptoms and understanding the symptoms. Stabilization phase - making sure they're not harming themselves. Cognitive behavioral treatments - These include correcting unreasonable negative memories such as “I'm responsible for losing my squad members when we were attacked.” Various skills are used for expressing the memories and bringing the traumatic memory to awareness. Schiraldi said art therapy can be very effective. “If a soldier comes in with unresolved trauma from his earlier life, such as child abuse, they're more vulnerable to getting PTSD from combat duty,” Schiraldi said. “Group therapy can be very helpful, especially for soldiers who feel that nobody but other soldiers can understand what they've been through,” Schiraldi said. Serotonin enhancers that are used to treat depression such as Zoloft have been found to be effective medications to combat PTSD. He said the Sidran Institute in Maryland keeps a registry of trauma specialists. “There is some evidence that you don't want to wait, that the sooner you get treated, the better your prognosis,” Schiraldi said. “Some people suffer for decades, not realizing that if they got treatment, their suffering would lessen quickly.” “The more you keep these memories secret, the more they will eat away at you,” he said. Schiraldi said many members of the World War II generation masked their painful war memories by drinking, and not talking about them for decades. He said a U.S. naval veteran who was in a Kamikaze attack in the Pacific on a warship had all his memories flood back over him almost 60 years later when he saw the World Trade Center attacked by terrorists on Sept. 11, 2001. So, the key here seems to be to seek treatment quickly rather than suppress. The faster you face and deal with your PTSD, the sooner you'll be able to check it and move on to the better things in life. I recently received approval to reprint the following moving poem written by a soldier who'd served in Mosul, Iraq with the mighty 101st Airborne. Known as Mr. Sandman, he's been blogging on his experiences in Iraq, as well as his experiences with PTSD now that he's returned home to his wife, family, and friends. His blog, "The Iraq War", Through the Eyes of a Soldier is a highly recommended journey. Thank you, Mr. Sandman, for your service, for sharing your difficult experiences with others, and for allowing me to reprint one of your many fine poems. In my eyes, you're a hero through and through. Wednesday, the New Freedom Commission on Mental Health regrouped on Capitol Hill to hear a variety of panels. One panel focused on the mental health of returning war vets. Kaiser Network webcast the event, and it's now available online. Social stigma and lack of funding are still preventing progress in the areas of veterans' health, suicide and mental health in the workplace, experts said Wednesday. Three years after President Bush convened the first New Freedom Commission on Mental Health, the commissioners met again to assess progress on the recommendations in their original report. Progress has been made on the individual level they say, with people locally taking up the cause of improving mental health services even in the face of dwindling budgets. The problem arises on the federal level -- and they attribute that to a lack of leadership. Stefanie Pelkey described the ordeal of her husband Michael, who began displaying symptoms of post traumatic stress disorder (PTSD) after he returned from fighting in Iraq. He had trouble accessing military mental health services, and his officers and wife -- who was also in the army -- did not realize the severity of his symptoms. He ultimately committed suicide by shooting himself in the chest, leaving behind his wife and a baby son. After her husband's death, Pelkey said she had trouble accessing benefits because her husband had not been diagnosed with PTSD by an official military psychiatrist. The families of returning soldiers need to be better educated on the symptoms of PTSD, Pelkey said, and services need to be made more widely available and for a longer period after troops return from war. "I feel the lessons have not been learned," she said. "I have traveled and seen programs that work, but they are different from post to post and sometimes not available at all. It needs to be centralized so all soldiers can access them. Pelkey added, "Until the senior leaders of our country start recognizing these deaths outside the theatre of operations, soldiers will not come forward with their own battles with PTSD." Frances Murphy, deputy under-secretary for health and health policy coordination at the Department of Veterans' Affairs outlined changes the agency is undertaking to help the estimated 18 percent of soldiers who served in Iraq and the 11 percent who fought in Afghanistan who have PTSD. The steps include instituting face-to-face sessions for returning troops, longer term post-deployment screening, and a "no wrong door" policy that offers veterans many entry points to access the VA mental health system. But more expansion is needed, Murphy said, to treat the ever-increasing number of veterans who need help. In the past three months, the VA has seen a 30 percent increase in PTSD diagnoses, she noted. To perform its mental health function well, said Joy Ilem of the Disabled American Veterans, the VA system needs to be better funded and better integrated with community and follow-up care options, and the period of eligibility for VA services needs to be extended from two to five years. Last year, I wrote of Stefanie Pelkey's struggle to make sense of her husband's suicide after returning from Iraq. Citing worsening health woes, U.S. Rep. Lane Evans, D-Rock Island, a prominent advocate for veterans' welfare, Tuesday announced that he will not run for re-election and will retire at the end of his current term. "When I announced in 1998 that I had Parkinson's Disease, my doctor said that this condition would not interfere with my work and that I would be able to perform at a high level for a number of years," Mr. Evans said in a statement released by his off ice. "That window of opportunity is now closing." Mr. Evans has been in and out of the hospital for several weeks. He cast his last House vote on Feb. 14. Mr. Evans was the ranking Democrat on House Committee on Veterans Affairs. A former Marine and staunch friend of organized labor, Mr. Evans won passage of a law that gives health benefits to children of veterans exposed to Agent Orange, a poison used during the Vietnam war. This is a tough day for me. I am announcing that I will not run for re-election and will retire at the end of my current term in the U.S. House of Representatives. When I announced in 1998 that I had Parkinson's disease, my doctor said that this condition would not interfere with my work and that I would be able to perform at a high level for a number of years. That window of opportunity is now closing. I fully expected that I would continue my work for the foreseeable future following this current break from the office. But I have come to recognize that the time needed to address my health makes it difficult to wage a campaign and carry out my work as representative. I will return soon and to the best of my ability complete the important work of this term in my roles as representative and ranking member of the House Committee on Veterans' Affairs. This decision is especially tough because this job means so much to me. I believe strongly in serving people and working to make a positive difference in their lives. Every day has been rewarding and I'm proud of what I've been able to accomplish and the fights I've made. I thank my family and everyone who has worked with me - great friends, terrific colleagues, a dedicated staff, fellow vets. And I appreciate the support of people I never met before who would ask how I was doing and tell me to keep up the good fight. I'll be doing that in the weeks and months ahead and look forward to thanking every one of you personally for all you have meant to me." To my constituents and veterans across this country, it is an honor and privilege to represent you. Contact information (no handy-dandy online contact form for us to use). 2211 Rayburn House Office Bldg. Rep. Evans: I'm going to miss reporting on your many good works, miss hearing how hard you're fighting to set things right by our veterans and by your constituents. You've been a shining example of what a public servant should and could be. Thank you so very much for that. All of my best to you for comfort, happiness, and quality time spent with family and friends. Thank you for your service to our country -- in and out of uniform. On April 29, 2002, President Bush established the New Freedom Commission on Mental Health to study how good current public and private institutions were at providing mental health services to its customers. The Commission met 11 times publicly, and reviewed 2,500 comments from "consumers, parents, family members, advocates, service providers, educators, researchers, and other concerned individuals." It issued its final report on improving mental health services in July 2003. The Commissioners are today returning to Capitol Hill to hear a variety of panels, the first focusing on the mental health of returning war vets. Presentations on this panel will be given by Frances Murphy, M.D., M.P.H. (Veterans Health Administration); Joy Ilem (Disabled American Veterans); and Stefanie Pelkey (former Army captain). Last year, I wrote of Stefanie Pelkey's struggle to make sense of her husband's suicide after returning from Iraq. Being more closely tied to and supported by their local communities, editorials from small-town newspapers are often a clearer indication of how 'average' Americans (if there is such a thing) feel about certain issues. Let's take a look at what Appleton, Wisconsin's Post-Crescent had to say about veterans health funding earlier this month. Under the [President's 2007] budget proposal, the funding for veterans' health care would grow from $24.5 billion in 2006 to $27.7 billion in 2007. After that, though, it would be cut 3 percent in 2008 and stay below $27 billion in each of the following four years. Now, consider that the average annual increase in the veterans' medical budget has been more than 10 percent since President Bush took office. Also consider that the needs will grow as veterans come home from Iraq, Afghanistan and wherever else they're sent. Finally, consider that President Bush "is committed to honoring America's veterans who have sacrificed so much for our nation" and veterans' health care has indeed gained a better reputation. But veterans' eligibility requirements already have been toughened. Now, future funding will get cut. Or will it? President Bush wants to cut the federal budget deficit in half by the end of his term in 2008. Cutting or holding the line on much domestic "discretionary" spending, such as veterans' health care, is how he plans to do it — at least on paper. According to the Associated Press, the White House "says the long-term budget numbers don't represent actual administration policies." In other words, they're numbers that might not mean anything, other than making the overall budget proposal look like it's reducing the deficit. The administration might not follow through on them. So that leads us back to Edwards' analysis. Either the budget proposal will do serious harm to the health care of the veterans who have nobly served our country and we will further dishonor our commitment to them — or the whole thing is just a sham. Feel free to offer feedback to the Appleton Post-Crescent by filling out the online form found below the editorial page. If you're in Maine, you may wish to plan to attend a public symposium for veterans and their families seeking to learn more about posttraumatic stress disorder. The program runs from 9 a.m. to 3 p.m. tomorrow (Saturday, March 25, 2006) at the Senator Inn in Augusta. Space is limited to 150 attendees; please call 778-7292 or 293-2580 to pre-register. Fee: $10 (may be waived for hardship) per person, lunch included. More details. Next month's Marine Parents Conference in Houston, TX offers its participants the "esprit de corps and the bonding atmosphere of United States Marine Corps and Navy families" in its three days of speaker presentations, breakout sessions, and workshops. Registration for the conference, which takes place April 21-23, 2006, is $195.00 and also includes entertainment and dinner on Friday, breakfast, lunch and dinner on Saturday and breakfast on Sunday. Additionally, from the website: "All conference attendees will receive a copy of the book Down Range: to Iraq and Back. The book addresses PTSD (Post Traumatic Stress Disorder) for our military personnel returning from combat. Attendess will have an opportunity to attend a panel discussion with the authors Bridget C. Cantrell, Ph.D. and Chuck Dean on Saturday." In a letter to Sgt. Shaft at Military.com, we learn of the VA's "new program for service members sustaining traumatic injuries, Traumatic Servicemembers' Group Life Insurance (TSGLI). [It] will help families focus on recovery, readjust to military or civilian life and ease worries about financial difficulties. The TSGLI benefit payments, ranging from $25,000 to $100,000, are made to service members who have suffered certain traumatic injuries while on active duty. The program became effective Dec. 1...[and b]enefits are also payable retroactively to Oct. 7, 2001, for service members and veterans who served in OEF and OIF." Are you a returning veteran coping with PTSD (or a military family member seeking help in supporting your troop with PTSD)? Getting answers to your questions can leave you stumped. Where can you turn? A good start is by looking at this list for ideas; another is to join an online community focused on combat-related PTSD. Be sure to check them all out. Each of them have their own vibe, so you're bound to find one that fits your own. The Wisconsin State Journal explores a new, experimental tool that researchers at Madison's Veterans Hospital are currently testing to gauge the effectiveness of posttraumatic stress disorder treatments. Called acoustic startle, the study will monitor eye flinch reactions, heart rate, and sweat production to sudden, loud sound to determine how severe the patient's PTSD is. Doctors at the Veterans Hospital are preparing for a new generation of veterans returning from Iraq and Afghanistan who might develop PTSD. They are researching new therapies for the disease that might make the condition more manageable for newly returned soldiers than it has been for many Vietnam veterans. The doctors are also looking at a new way of assessing the effectiveness of PTSD treatment. The experimental assessment tool, called acoustic startle, is based on the flinch of a patient's eye muscles. It's a reflex to a sudden sound that can be measured by the contraction of the obicularis oculi, the muscle that gives people of a certain age bags under their eyes. As with most psychological disorders, doctors now use questionnaires to rate symptoms of PTSD and determine whether medications or psychotherapies help patients get better. But sufferers of PTSD, many of them men who have been in combat, can be reluctant to acknowledge their symptoms, doctors say. Improvements in irritability, detachment, nightmares and flashbacks can be subtle. In a study about to begin at the VA, electrodes will be placed below the eyes and on the arms and hands of veterans with and without PTSD. The subjects will wear headphones through which piercing tones will randomly ring. During 10-minute sessions of loud beeps, their eye muscle contraction, along with heart rate and production of sweat, will be measured. Some participants will have recently started detox for alcohol abuse. The goal is to see if acoustic startle is a useful way of quantifying the severity of PTSD - and to learn if some patients, likely those who react most to sudden noise, "self-medicate" by drinking. Historical and contemporary records provide evidence that an important symptom seen in combat veterans diagnosed with Shell Shock, Combat Fatigue or Post Traumatic Stress Disorder has been, and continues to be, an exaggerated startle reflex. (6-9) Clinical observations of exaggerated startle in distressed combat veterans were so common by mid-century, some psychiatric authorities argued that increased startle was cardinal symptom of combat fatigue (10). While not considered the cardinal symptom of PTSD today, exaggerated startle remains tightly linked to trauma related psychological illness. In fact, according to DSM-IV, PTSD is now the only anxiety disorder in which hyperstartle is listed as a core symptom. Investigators have had various motivations for studying the acoustic startle reflex in humans and especially in those suffering from PTSD. Some have been interested in finding out whether or not exaggerated startle is a marker (or sign) indicating, or helping to provide a reliable diagnosis of PTSD. The idea of an objective test for PTSD remains extraordinarily appealing to many clinicians and forensic specialists. It is felt that such a test would enhance discrimination between individuals who do and who do not have PTSD. For other investigators, startle has been less interesting as test for PTSD, and more interesting as a probe in examining central nervous system reactivity in individuals with PTSD. Because so much is known about the neuroanatomical pathways of, and neurotransmitters involved in the startle reflex, several studies have used startle to gain an understanding of neurohormonal functioning in PTSD. Finally, several investigators have used startle as an objective measure of the emotional states of anxiety and fear and have used startle as a tool to elucidate the neural mechanisms involved in the learning and extinction of fear and anxiety. The startle reflex is one that is shared by very nearly all animals. In basic terms, it is the rapid motor twitch or jump that occurs when an animal or human is exposed to a sudden stimulus (such as a touch, a noise, or a visual image or light). The term acoustic startle reflex refers to the startle response to loud or sudden sounds. In humans, the most consistent and easy way to measure the acoustic startle reflex is to record the speed and intensity of the eye-blink that occurs after someone hears the noise. "Imagery rehearsal therapy" to reduce nightmares - and, sometimes, other symptoms. "You practice a dream and change the ending," said researcher Tracey Smith. The short-term use of steroids to boost cortisol, a stress hormone. Some patients with PTSD have low levels of cortisol, perhaps because a sudden rush of it following a traumatic event has blunted production. A two-week dose of steroids "could help normalize that system," said researcher Catherine Johnson. Use of the drugs risperidone and quetiapine, both antipsychotics developed for schizophrenia, in addition to the antidepressants typically given to patients with PTSD. Researchers are also testing the use of prazosin, a blood pressure medication that slows down the sympathetic nervous system, commonly known as the "fight or flight" response to danger. Great to see these studies moving forward. An unbelievable story from the San Diego Union-Tribune today. Troops are now returning to the field of battle carrying their own supply of antidepressant and anti-anxiety medicine; service members who are having mental health issues are routinely sent into combat for a second, third, or fourth tour. Is this safe? Is this sane policy? Stress reduces a person's chances of functioning well in combat, said Frank M. Ochberg, a psychiatrist for 40 years and a founding member of the International Society for Traumatic Stress Studies. The DOD doesn't keep track of troops returning to combat medicated for mental health disorders; however, Army and Marine Corps medical officers confirm that medicated soldiers and marines are returning to the combat zone. Buttressing the idea that large numbers of service members are medicated, more than 200,000 prescriptions for the most common types of antidepressants were written in the past 14 months for service members and their families, said Sydney Hickey, a spokeswoman for the National Military Family Association. Hicks said a Defense Department official gave her the information during a December briefing. She said the official did not distinguish between prescriptions for the troops and those for their family members. In addition, the Defense Department has not provided prescription totals for such antidepressants from before and after the United States invaded Iraq in 2003. Politics and penny-pinching are part of the problem. Mental-health care for service members and the Defense Department's efforts to keep the mentally ill in uniform are becoming national issues, said Steve Robinson, director of the National Gulf War Resource Center in Silver Spring, Md. Robinson said three Army doctors have told him about being pressured by their commanders not to identify mental conditions that would prevent personnel from being deployed. Medical practice and ethics questions loom large, too. Cmdr. Paul S. Hammer deals with such issues daily. Hammer, a psychiatrist, is responsible for the Marine Corps' mental-health programs during this deployment rotation. He confirmed that Marines with post-traumatic stress disorder and combat stress are returning to Iraq, though he would not say how many. Ultimately, much is unknown about the rates of post-traumatic stress disorder among Iraq veterans, especially those who have been through more than one combat tour, said Matt Friedman, executive director of the U.S. Department of Veterans Affairs National Center for PTSD in White River Junction, Vt. If you'd like to thank the San Diego Union-Tribune for their coverage of this issue, please do. NPR's Morning Edition today briefly covered the difficulty of multiple tours on soldiers and their families. Full audio and transcript of the program are available online. The Chicago Tribune presents an interview with Ed Klama, a social worker and PTSD program director at Hines VA Hospital at Maywood, IL. From WWII veterans dealing with late-stage PTSD to recently returned troops from OEF and OIF, the discussion deals with war's consequences and the role good counseling plays in Quelling War's Aftershocks. To accompany the print piece, they have the full interview audio available online. If you'd like to thank the Chicago Tribune for their PTSD coverage, please do. Yesterday's 3rd anniversary of the Iraq invasion found an interesting situation brewing: returning veterans coping with post-traumatic stress disorder [PTSD] are no longer being hidden away from our view. The media is beginning ever-so-slightly to lift the veil on this nerve disorder affecting at least 16,000+ of our troops who've served in Afghanistan and/or Iraq. Since we have so very little else to celebrate as another year moves forward with no end in sight to war and its victims, I'm going to focus on the good reporting on this issue that is finally, finally seeing the light of day. And I celebrate the fact that rather than using this anniversary to glamorize and glorify the war, the media seem to have finally decided to use it to introduce this ballooning problem at last to the public. There were many more reports that didn't find their way onto this list. Some were in local papers without online editions; others I haven't turned up, yet. If you know of any that I've missed, please drop them into comments; I'll be happy to add them. Spanning an enormous 12 online pages, one explanatory editorial, and an introduction by the author, Julie Sullivan (assisted by Torsten Kjellstrand), the Oregonian delivers its readers a grand public service this morning. Through the experiences of the Stout family (who were extremely gracious in allowing reporters into their lives to record their story), America receives a detailed view of the struggle some of our veterans -- and their families -- are facing as they cope with post-traumatic stress disorder. This important article is so exhaustive and detailed, that it is impossible to do it justice in any way here; please just take the time to read it. And after you've finished, please contact The Oregonian and commend them for devoting resources and taking great care in presenting this topic to their readership. You might also wish to contact the reporters, Julie Sullivan and Torsten Kjellstrand, to offer your personal thanks. New England Cable News (NECN) is set to air a new documentary, Hidden Wounds, detailing the struggle of three local soldiers who've returned from Iraq with post-traumatic stress. If you're in the viewing area, you can catch it today at 10:00AM and 7:00PM. NECN will re-broadcast the special throughout the week [times/dates - scroll down]. For those not in the viewing area, the Boston Globe has an article out today and online clips are available. "Hidden Wounds," which debuts Sunday at 10 a.m. and 7 p.m., tells the stories of Fick, currently a Harvard graduate student, Sgt. Russell Anderson, a longtime military man from Norton, and Jeff Lucey, a Marine who killed himself several months after returning to Belchertown. "These are three very different men," said Iris Adler, the film's producer and writer. "In spite of their differences, they all come home with post-traumatic stress disorder." About one in six soldiers from Iraq and Afghanistan are suffering from post-traumatic stress disorder and depression, according to studies cited in the documentary. The soldiers in the film believe that the percentage is much higher, but a stigma prevents others from admitting the struggle. "There's a lot more people out there than you think like me," Anderson, 55, said this week. Fick, a Dartmouth graduate, joined the military to test himself and because he believed members of the privileged class should serve. In Iraq, he led a reconnaissance unit to Baghdad. Carnage became commonplace, and the pressure of making life and death decisions was relentless. When he returned home, Fick fell into deep depression. He found relief writing about his experiences, an exercise that became the book, "One Bullet Away." Fick said he hoped telling his story makes post-traumatic stress disorder real to people who don't know a soldier. People returning from Iraq are going to have serious problems, he said, and society needs ensure they get proper care, unlike so many Vietnam veterans. "Their problems have endured the 30-40 years since they came back," Fick said. "I don't want to see that repeated." Don't forget to view the online clips if you're outside of the viewing area; and take a moment to thank NECN for their efforts at getting more to understand the plight of those troops coping with PTSD. The New York Daily News presents an op-ed piece written by Dr. Gene Bolles, "chief of neurosurgery from November 2001 to February 2004 at Landstuhl Regional Medical Center, America's tertiary hospital serving our troops." As we arrive at 20,000+ wounded and 2,600 killed in action, the physician remembers those he's crossed paths with these past three years. With the third anniversary of Operation Iraqi Freedom upon us, I am reminded of war's horrors, but also of the unparalleled sacrifice and loyalty of the men and women who serve this nation. During my time at Landstuhl, I evaluated hundreds of men and women. As a civilian not in their chain of command, the servicemen and women often confided to me that they were living in constant fear as witnesses to the agony of war — the smell and sounds of death; seeing their buddies mutilated, along with Iraqi men, women and children. Most of those who are killed or wounded are under the age of 22. Those who are seriously injured (some with only one extremity remaining, some blinded and severely disfigured) frequently express a strong desire to go back to their units to complete their tour of duty and protect their buddies. He tells the story of a 19-year old woman who came to him with severe back injuries; and he remembers the 21-year old man who'd lost two limbs, yet was still more worried about his buddies. They are, every one of them, true heroes. And it is these heroes who pay the many human costs of war. In addition to post-traumatic stress disorder (it is estimated that 35% are afflicted), there is traumatic brain injury (often disabling, unrecognized and untreated), chronic pain and spinal damage, blindness and the questionable effects of undepleted uranium. Instances of amputation in the Iraq War are reportedly double previous rates, and while the military medical care is the best in the world, there are still long-term problems with disability and chronic pain often requiring multiple surgeries. I have the highest regard for the medical care offered by the Veterans Administration and our military. But there are many problems associated with the bureaucracy, which often stymies the efficiency of the delivery of care, which is paramount. After soldiers are discharged, they are dependent on our Veterans Administration, an overloaded and underfunded system. This system designates only 30 minutes per month for treatment of post-traumatic stress, and can take from six months to a year to provide treatment in various specialty clinics. Unfortunately, our global war on terror is only going to add to the number of veterans suffering from war-related injuries. Our esteemed athletes in the NBA, NFL and NCAA receive medical care and appropriate testing almost immediately upon being injured. Our soldiers and their families deserve no less. If we can spend $7 billion to $10 billion dollars a month on a war, we must also afford to help rebuild lives impacted by this war. On the third anniversary of the invasion of Iraq, it is important to reflect on the lessons learned and where to go from here. Many mistakes have been made, from poor prewar planning to a failed postwar reconstruction policy. Often overlooked, and just as alarming, are the inadequate resources available to help service members cope with their emotional and psychological scars when they return home. Post-war planning does not stop at Iraq’s border. We must provide the support our service members need to re-enter civilian life when they return stateside. The current system is fundamentally flawed: it neither pays adequate attention to veterans suffering from mental health disorders nor dedicates sufficient resources to diagnosing and assisting them. A July 2004 New England Journal of Medicine study found that one in five of our troops involved in ground combat in Iraq suffer from Post Traumatic Stress Disorder (PTSD), symptoms of which include major depression and generalized anxiety. Even more troubling is that service members at a significant risk of mental health problems have often resisted seeking help because of the stigma associated with treatment. Among returning service members, only between 23 percent and 40 percent of those who tested positive for a mental health disorder sought professional help. This alarming statistic illustrates the need to educate our soldiers on this issue, and to end the stigma surrounding a legitimate illness. The war in Iraq is the bloodiest in a generation, with urban and close quarter combat that is bound to leave lasting emotional scars. 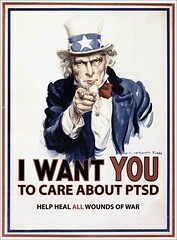 The reality is, the longer we fight the war in Iraq, the more troops will return suffering from PTSD. Working to address PTSD continues to be one of my top priorities in Congress. In the 2006 National Defense Authorization Act, I worked with my colleagues on the Armed Services Committee to include a Mental Health Task Force that will study how the Defense Department and the Armed Services can better identify, treat, and support mental health needs for service members and their families. While this is a good first step, we must dramatically increase the amount of funding for PTSD screening and treatment to adequately assess and care for the emotional wounds of our returning service members. It’s unconscionable to send our brave young men and women into Iraq and then not try to make them whole -- mentally as well as physically - when they come home. Last spring I introduced the Help Extend Respect Owed to Every Soldier (H.E.R.O.E.S.) Act, which would create a peer support program to educate military personnel about PTSD. It would also create a Defense Department mass media campaign to raise awareness about mental health and substance disorders among service members and their families. This program, which was endorsed by Dr. William Winkenwerder, Jr., assistant secretary of defense for Health Affairs at the Department of Defense, will help remove the stigma and encourage people to seek treatment. The H.E.R.O.E.S. Act also requires that service members undergo a thorough mental and physical examination before being sent home. The current mental health screening is just a form to be filled out, not a real exam. If an examination reveals the need for treatment, it would be provided when the service member is back with his or her family, so returning troops don’t need to be concerned that revealing symptoms during an examination would delay their reunions with their loved ones. By reducing the stigma of PTSD, screening soldiers for the illness, and providing treatment for those affected by the illness, the H.E.R.O.E.S. Act will help thousands of returning soldiers win their final battle in this war. President Theodore Roosevelt once said that anyone "good enough to shed his blood for his country is good enough to be given a square deal afterwards." We have a responsibility to the brave men and women returning from Iraq to provide them with the care and services they rightly deserve. If you support this work, contact Rep. Meehan and let him know you have his back, and contact your own representatives to ask them to support the above legislation. And if you wish to thank the MetroWest Daily News for running this important public service column, I think they'd appreciate hearing from you. Finally, take a look at which other legislators are working tirelessly on behalf of our returning combat veterans. Newsweek today runs a web exclusive (why it's not in the print edition, I'll never know...) dealing with the hard realities facing our returning troops coping with brain injuries coupled with PTSD. Take a glimpse inside their world through one soldier's experience. Newsweek offers us the story of Sam Reyes, a Marine who was severely wounded in a Fallujah suicide bomb attack in September of 2004. He was one of the fortunate ones to have survived that day (12 others weren't as lucky); but, injuries he most likely would not have survived in previous wars have left his life radically changed. Following a painful 18 months of recovery, he's still struggling to piece his life back together. Like more than 1,700 military personnel wounded in Iraq and Afghanistan in recent years, Marine Cpl. Samuel Reyes Jr. is suffering from traumatic brain injury, known in military jargon as TBI, which leaves survivors unable to perform the most basic cognitive functions. According to officials at the Walter Reed Army Medical Center in Washington, TBI affects more than 25 percent of bomb-blast survivors like Sam Reyes, making it the signature injury of the Iraq war. In fact, military officials say that were it not for advances in body armor, helmets and drastically improved battlefield medicine, the majority of survivors being treated for TBI would not have even survived their injuries as recently as the first gulf war 15 years ago. The increasing number of TBI survivors and the vexing limitations they face has become an enormous challenge for both military medicine and for the Department of Veterans Affairs, which will treat these survivors for life. "In the military, the question is 'are you battle ready?'" says Dr. Harriet Zeiner, a clinical neuropsychologist for the VA in Palo Alto, Calif., where Reyes is being treated. "Our criteria at the VA [are], are you going to be able to hold down a job, sustain a relationship, get married, have kids or do you have something that's going to impair you?" For Reyes, and hundreds of others suffering from TBI, the answers to these questions are still far from clear. The diffuse but debilitating symptoms of traumatic brain injury—which sometimes are not apparent until months after the bomb blast—can leave veterans with festering psychological problems and anger that often lead to failed relationships and careers, substance-abuse problems and the inability to adapt to civilian life. Many TBI patients, like Reyes, are also suffering from posttraumatic stress syndrome (PTSD), a psychological condition affecting many combat veterans and other trauma survivors that is marked by flashbacks, nightmares, anxiety and irritability. The combination of TBI and PTSD, says the VA's Zeiner, "is pretty deadly." Reyes suffered damage to the frontal lobe of his brain, the area that helps a person calm himself after a stressful or frightening experience and where problem-solving takes place. When Reyes becomes anxious, he quickly escalates to a state of agitation. It's not uncommon, says Zeiner, for those suffering from TBI and PTSD to "either drink themselves into a stupor," in an effort to self-medicate, or to become agoraphobic, afraid to go out where they may have to contend with overwhelming stimuli. Reyes goes on to explain how his memory loss frustrates himself and others around him. He also explains his journey receiving care for his PTSD. Soon after he arrived at the brain-injury center, Reyes's doctors began trying to convince him to go for treatment at the VA's PTSD center in nearby Menlo Park, where Vietnam veterans work side by side with active-duty Marines and soldiers, trying to find ways to deal with the lingering trauma of their respective wars. At first, Reyes resisted, worried that his fellow Marines might think he was weak. Meeting the other men in the PTSD treatment center had a big impact on him. "Some of them are real tough, big guys, real smart, and that made me feel better. It showed me I wasn't the only one in the whole world who would have it." Reyes says his fellow Marines who haven't gotten help are suffering. "I tried to let some guys know who I thought could use help, and they said, 'Nah, I don't need that. I take sleep medicine and I drink, so I'm doing pretty good'." Although the Marine Corps is sending some mental-health workers into the field, Reyes says he didn't have any discussions about combat-related stress. He got a brochure about PTSD at one point, but says it didn't explain the symptoms. "It scares me that all these guys could be just like me, having the same problems, and they're getting ready to ruin a whole lot of their life." As the population of wounded Iraq veterans increases, the military is also trying to raise awareness about TBI, especially the less severe cases like Reyes's, which can easily be misdiagnosed or overlooked in the chaos of battlefield medicine. The Defense Department is developing a training course for medics to teach them how to screen for TBI in the field. Any injured combatant who has lost consciousness is a candidate for TBI diagnosis. The military is also making plans to station a TBI expert at medical facility in Germany where the U.S. wounded are first evacuated after leaving Iraq. "I'm sure people do get misdiagnosed , says Dr. Warren Lux, deputy director of the Defense and Veterans Brain Injury Center at Walter Reed. "That is why we are trying to get education out there." Read the rest of the piece, and then let Newsweek know you appreciate the coverage on this topic -- and perhaps they might even run it in the print version next time, too. Introduced by Congressman Lane Evans [D-IL], Ranking Democrat on the House Veterans' Affairs Committee and Congresswoman Shelley Berkley [D-NV], Ranking Democratic Member on the Committee's Subcommittee on Disability Assistance and Memorial Affairs, HR 4914 would "amend title 38, United States Code, to remove certain limitations on attorney representation of claimants for veterans benefits in administrative proceedings before the Department of Veterans Affairs, and for other purposes." [HR4914] would permit veterans to hire an attorney when they disagree with a benefits claims decision of the Department of Veterans Affairs (VA). Currently, veterans are not allowed to hire an attorney until the end of the administrative appeals process, specifically, after the Board of Veterans Appeals has rendered a decision. "We recognize that many fine veterans service organizations have traditionally provided full representation to veterans and their families without cost and expect that these organizations would continue to represent most claimants. Nonetheless, we believe that in this day and age, veterans should not be prohibited from hiring an attorney if they choose to do so,"said Evans. The restriction on attorney representation dates from the Civil War era when concern for attorneys preying on sick and disabled veterans resulted in legislation which limited the fee attorneys could charge to $10.00. Although the $10.00 limit no longer applies, veterans are currently prohibited from hiring an attorney to appeal an initial VA decision. Evans and Berkley said the "Veterans' Choice of Representation Act" responds to a January 22, 2006, Washington Post article which questioned: "If American soldiers are mature and responsible enough to choose to risk their lives for their country, shouldn't they be considered competent to hire a lawyer?" Contact your representatives with your feedback.